ViewSonicâ€™s VX2270Smh-LED features an LED backlit 22â€ (21.5â€ viewable) frameless widescreen monitor with up to 40% energy savings compared to a regular 23â€ monitor. Environmentally friendly mercury-free VX2270Smh-LED offers Full HD 1920x1080 resolution, HDMI and DVI with HDCP and VGA inputs, SRS Premium Sound, external power supply, and 30,000,000:1 MEGA Dynamic Contrast Ratio. The stylish glossy ID and thin profile combine to make it the center piece to your home or office. While the SuperClear IPS panel with wide viewing angles and high contrast ratio delivers extraordinary visual entertainment. A 3-year limited warranty, the industryâ€™s best pixel performance policy, energy-saving Eco-mode and Windows 7 certification make VX2270Smh-LED an excellent choice for entertainment and gaming. 30,000,000:1 MEGA Dynamic Contrast Ratio for true-to-life picture depth and clarity in any room. 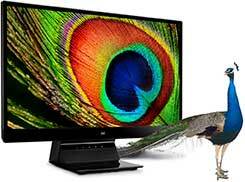 Uses 40% less power, without compromising your viewing quality and has mercury-free WLED backlight. Super Wide Viewing Angles: ViewSonic SuperClear IPS monitors produce true colors and consistent images when viewed from the front, from the sides, from below, and from virtually any other viewing angle. No matter your perspective, you will not have any color shift or changes in contrast ratio when you move the image across the screen or change your viewing angle. With its mercury-free backlight and low energy consumption, the ENERGY STAR certified VX2270Smh-LED saves your electricity bill. The savings of LED can add up to thousands of dollars saved for large install bases, such as big corporate buildings or schools. The savings can be as dramatic as $20,000 in five years! One of the great features of VX2270Smh-LED is its ability to dim the backlight completely for pure darkness during dark scenes, such as a night shot in a movie. Contrast ratios refer to the ratio of the brightest color to the darkest color. With traditional CCFL backlit displays, contrast ratios are limited to the fluorescent lampÃ¢â‚¬â„¢s ability to dim, in order to reproduce darkness. However, with the LED backlight, each LED has the ability to completely shut-off allowing for a near infinite ratio of black to white contrast. The end result is true blacks that result in greater overall image quality. 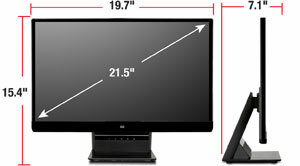 The VX2270Smh-LED features a 22" (21.5â€ viewable) widescreen with 1920x1080 resolution is capable of displaying a native Full HD 1080p image. 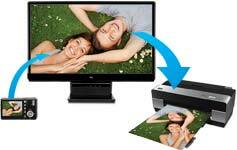 Today, devices that can display Full HD content output are getting more and more common. However, without a native Full HD display, you will not be able to experience the picture clarity and the details of the 1080p content you view. 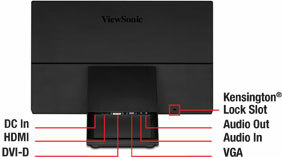 ViewSonicâ€™s proprietary Eco-mode function comes standard with the VX2270Smh-LED. When you donâ€™t need all the power the VX2270Smh-LED has to offer, you have the option to reduce the monitorâ€™s brightness, save energy, save the planet and prolong the lamp life. You can select one of the â€œOptimizeâ€ or â€œConserveâ€ options and save up to 30% energy. Especially under low ambient light conditions, adjusting the brightness will improve visibility by reducing eye fatigue. 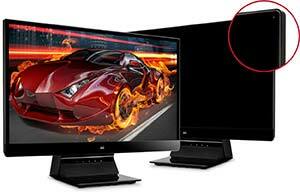 Reducing brightness will also prolong the monitorâ€™s lamp life, improving your return on investment. Industry-Leading Pixel Performance Guarantee and 3-Year Limited Warranty. *Energy savings may vary based on usage and other factors. Corporate names and trademarks stated herein are the property of their respective companies. Top Level Categories for ViewSonic VX2270SMH-LED 22-Inch SuperClear IPS LED Monitor (Frameless Design, Full HD 1080p, 30M:1 DCR, HDMI/DVI/VGA).